Located about 16 miles south of Birmingham, Redditch is a large town known for its needle industry of the 19th century and more recently in 1960s being recognized as a model for modern new town planning. The town is always full of life and glittering with possibilities, Impress Blinds in most of West Midlands of England including Redditch provide just the suitable beautiful and functional windows blinds that add to the elegant interior designing while offering much boosted functionality at the same time. We offer our clients in the town Made to Measure Blinds that cover up the entire windowpane and when you have selected the right materials and styles of blinds, dark cozy interiors or much bright ones can become very much possible. Impress Blinds offers some of the widest selection of windows blinds in terms of their materials, shapes, styles, colors and surface treatments. Whichever design or other customizations you prefer, we will provide efficiently. If you are someone who appreciates bright vivid interiors, try our day perfect vision blinds that have surface perforated patterns in them always allowing daylight and fresh air and are perfect for commercial office interiors or family rooms in domestic settings. Go for the efficient and Cheap Roller Blinds if you require the ultimate choice in printed designs or try our perfect Vertical Blinds that bring great covering options for large wide windows. 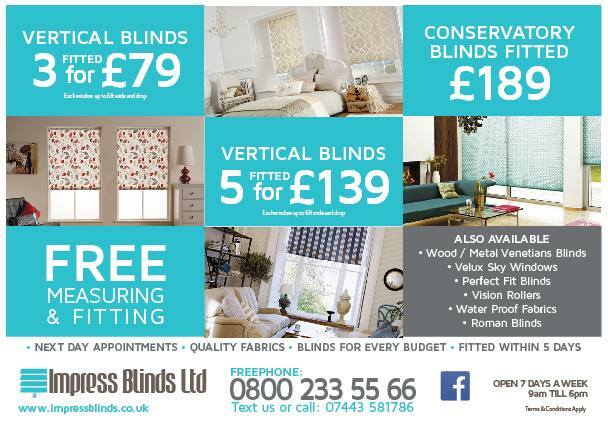 For your conservatories in Redditch, we have different colors, materials and designs of Conservatory Blinds or for the bedrooms where dark cozy rooms can be one form of a requirement, we have the efficient Roman Blinds that are made from fabric materials and are also very print friendly. Go for full window blockage with Velux or Shutter Blinds or try our cheap and lasting Metal Venetians for a profound window covering option. Anyone will sell you cheap windows blinds that don’t stand the test of time that well, Impress Blinds is the name in UK West Midlands that you can trust when you want long lasting great quality windows blinds for your interiors. We use high quality materials that are processed very efficiently and get treated with much durable and long lasting additional accessories like strings, clips, rods or other used ones. The opening and shutting mechanisms are usually the most vulnerable parts of any windows blinds, Impress Blinds makes sure to empower our offerings with high quality accessories that keep them going good as new for as long as required in Redditch. With their beautiful designs, patterns, colors and styles combined with longest lasting features, Impress Blind’s high quality window coverings have become the most reliable and well accepted in the UK West Midlands region. We are always trying to make our products better and last longer with choice in materials and high quality processing. Where other providers in the UK sell you windows blinds and no other add-on services, Impress Blinds makes the difference with highly appreciated add-ons. Our special free window measuring service in Redditch gets you a free and precise window measurement on the same day when you call us at an early hour or otherwise a next day appointment is pretty much guaranteed. We understand that not everyone is as handy with measuring windows especially the unusually shaped ones, for this we send our experts who don’t miss even a millimeter and order perfectly Made to Measure Blinds for your specific windows. Once your perfect windows blinds are ready, we will come down again and fit them perfectly on your windows finishing everything in a clean and neat touch. Our major clients in Redditch (UK) are much satisfied with our services.